KBB Designs offer a superb range of shower cubicles, wet room look walk in showers and wet rooms. A lot of our customers are now taking out the bath and replacing it with a very functional walk in shower cubicle, especially in the en-suite. Level access wet room with anti slip tiled floors or non slip vinyl flooring is available so very practical and completely safe. Cubicles with anti slip stone resin shower trays and 'stay clean' glass to make day to day cleaning easy. Power showers with adjustable riser rail heads, ceiling rain shower drench heads and body jet options available. New shower rooms/en-suites in existing bedrooms a speciality. Our free, no-obligation shower and wet room design service includes a home visit to take exact room measurements and discuss the objectives of your project – whether you’re looking to renovate a family bathroom or add an en-suite or wet room. 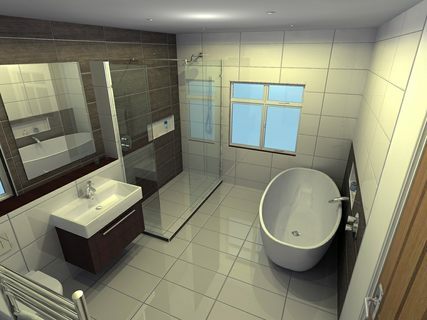 During our consultation we will also determine your specific aspirations for the look and feel of your new bathroom. Our experienced service will provide guidance on selecting just the right products from our extensive luxury shower range – including designer furniture, showers, stunning tiles, flooring, heating, lighting, taps and accessories – in order to achieve your dream shower room.